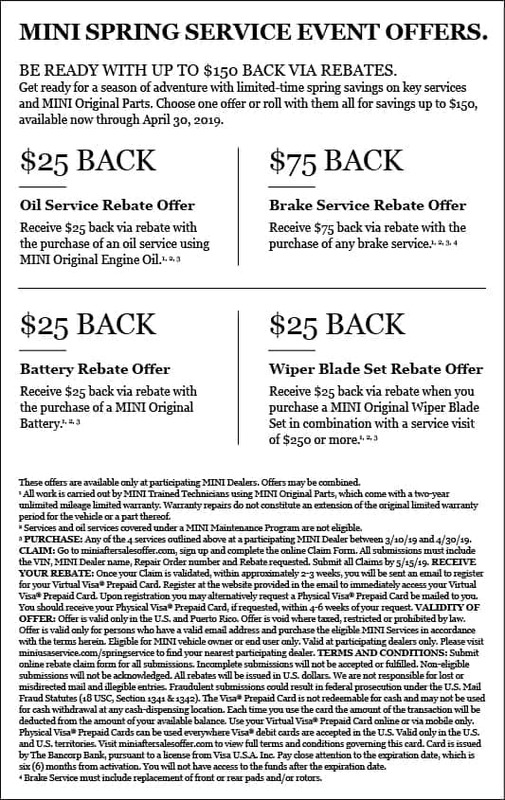 At MINI of Santa Monica, our goal is to make it easier and more affordable for MINI owners to get the service and parts they need. Sure, you can rely on service from a second-hand shop, or you can get your parts from the chain around Beverly Hills. But our customer experience is second-to-none, and our large stock of parts on hand make our Santa Monica dealership an attractive option. Whether you drive a new or a certified pre-owned MINI, your vehicle deserves the best—and at a fair price! Here, you’ll find our ever-changing selection of service coupons, parts coupons, and more. Whether you’re on the hunt for new tires, a seasonal service checkup, or genuine accessories, be sure to check back here for new offers! Whether you don’t feel comfortable changing your own oil or want the experts to rotate your tires, you can simply print out your preferred coupon, bring it to your scheduled appointment, and show it to us at the time of your write-up. It’s that easy! If you have additional questions, contact us online or by phone.